Founded in 2011 by owner Shannon Lua, Butter Studio has since gained a name for its excellent bakes - cupcakes, cakes, and tarts. 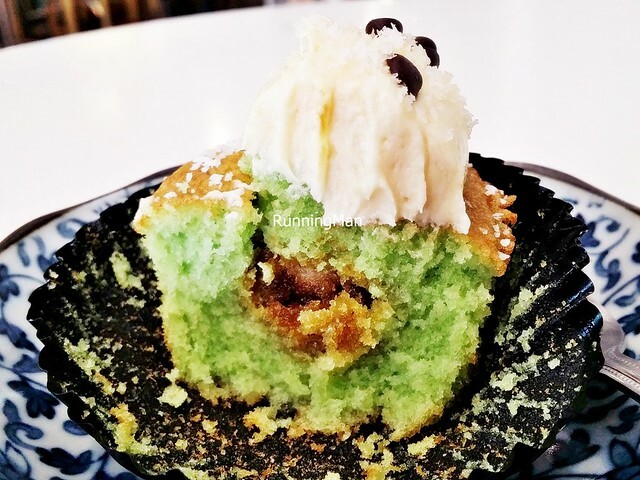 Ever since it expanded from a takeaway kiosk to its own cafe in 2013, Butter Studio has still been drawing in folks who love a good cupcake, brightening the eclectic atmosphere of Jalan Besar. 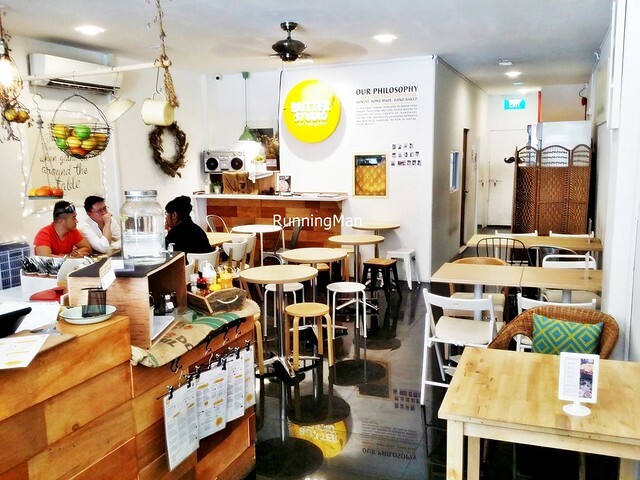 Ambience at Butter Studio is rather nostalgic and quirky. 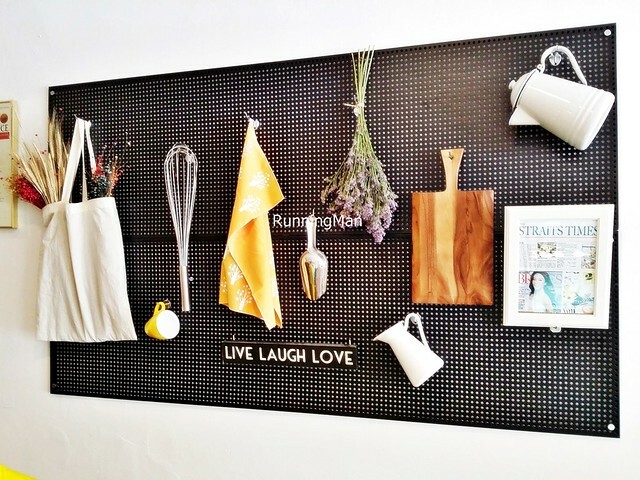 Repurposed from the family's old photo studio, the warm, inviting space is lined with mismatched but comfortable furniture, and the walls are decorated with items ranging from kitchen baking tools, to quirky quotes, to retro gadgets. The kitchen, situated behind, perfumes the place with the wonderful fragrance of fresh bakes. 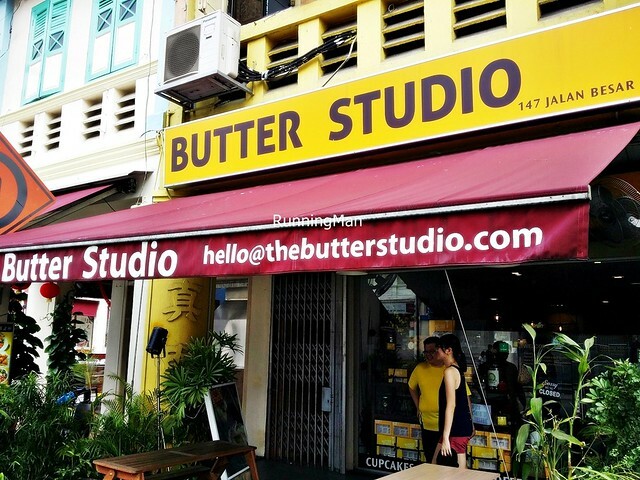 Service at Butter Studio is partial self-service, where ordering and payment is done over the counter, though staff serve orders to your table. I find staff to be rather knowledgable on the various cupcakes and menu items, able to answer basic questions. They're friendly enough, though they don't offer greetings when you enter / exit, and you're also supposed to seat yourself. 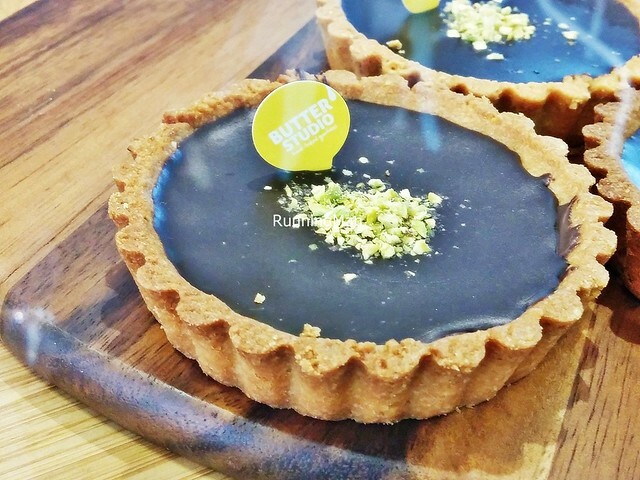 Food at Butter Studio is halal certified, and revolves around a small menu of main courses, and their fantastic bakes. The main courses are quite filling, and mostly American or British inspired dishes. Taste is mostly decent, with some misses. But the standout items here are their cakes, cupcakes, and tarts, I like that it's not as sweet as other pastries from elsewhere. 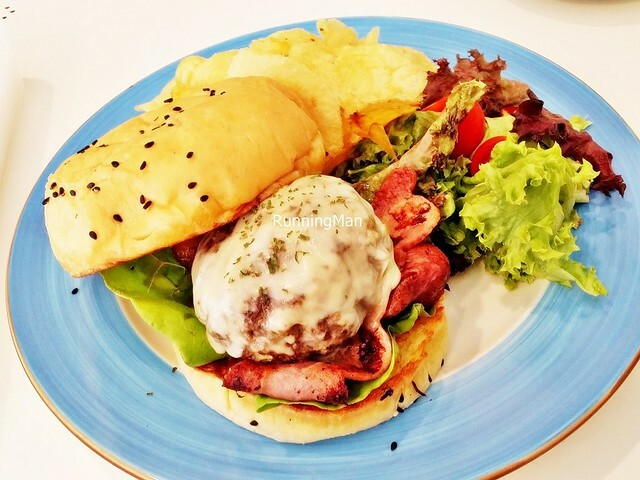 Prices are reasonablely lower too, budget about SGD $25 for a 2 course meal here. The cheery atmosphere is a burst of freshness in this area, and the wonderful aroma of baking is so intoxicating! 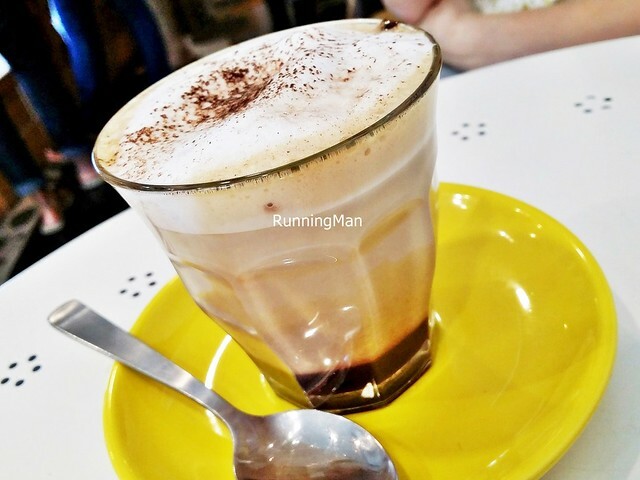 The Mocha (SGD $5.50) is good, with a nice, full bodied flavour and solid chocolate taste. The chocolate stands out more than the coffee though. 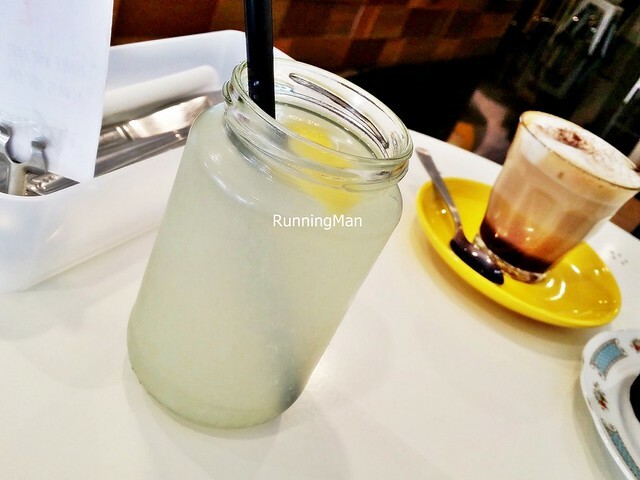 The Lemonade Original (SGD $6) is a great thirst quencher, with a good sour strength, yet isn't too overwhelming. Very refreshing and easy to drink, I only wish they would chill it slightly more so it's colder! 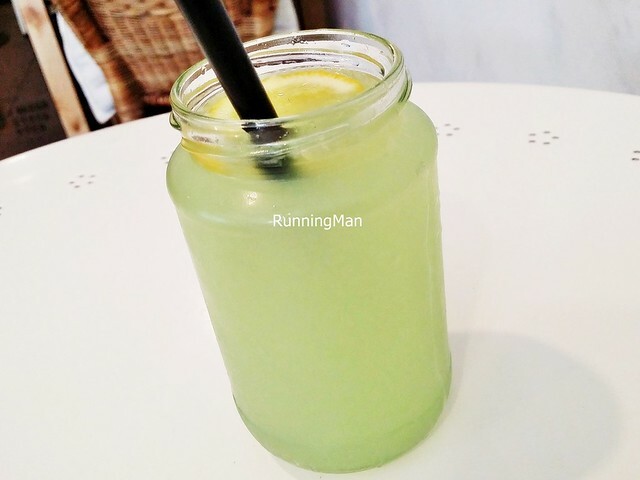 The Lemonade Green Apple (SGD $6) is just as refreshing, but with a sweeter taste of green apple, blending well with the sourness of the lemonade. 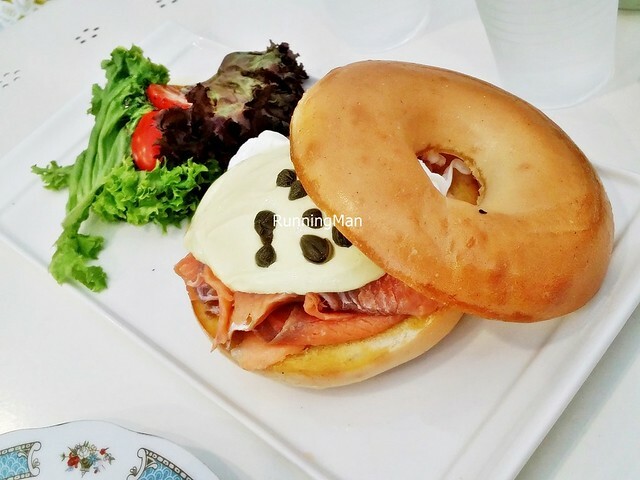 The Norwegian Royale (SGD 16.50) is served with fragrant buttery toasted bagels, slices of sad looking limp smoked salmon, and perfectly poached runny eggs, covered in a weird wasabi hollandaise sauce, which is too creamy in texture and not as spicy as I would have liked. A hit and miss dish. 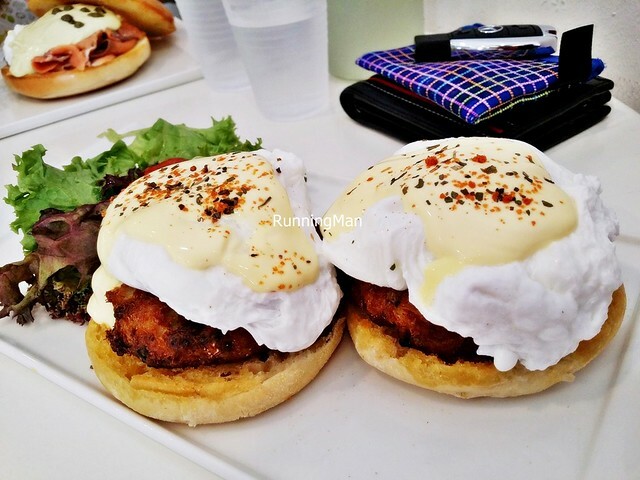 The Eggs Neptune (SGD $18.50) is served with hand formed, house special crab cakes, on thin, toasted English muffins, topped with perfectly poached runny eggs, and a creamy hollandaise sauce. 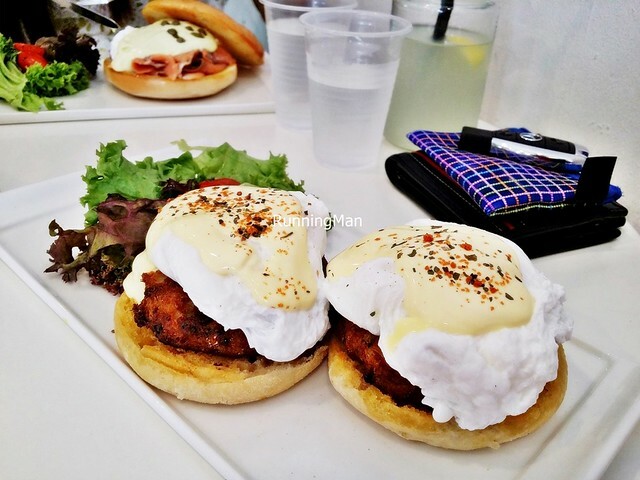 Love the tasty deshelled crab cakes, which aren't dry, and the combination of runny egg yolks with the muffins! A delightful dish! 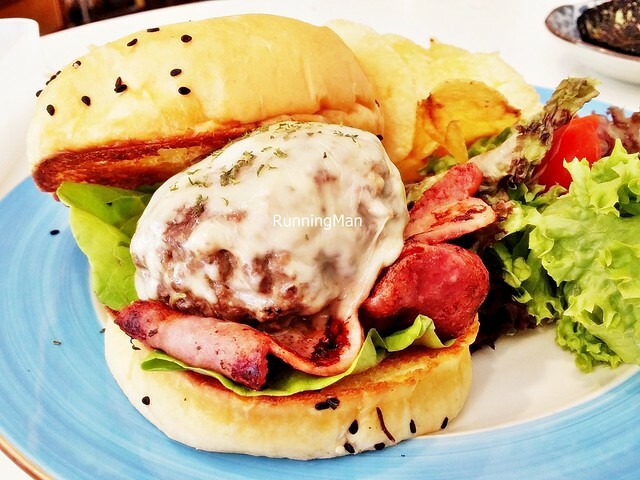 The highlight of The Godfather Burger (SGD $15) is the thick, round, hand formed, full flavoured, juicy beef patty. Fragrant with rosemary, sage, and salt, the beef patty is juicy all the way through despite its size, and very tasty, though it's also a tad too salty. The toasted sesame seeds burger buns are buttery and fragrant, tearing apart easily. However, the turkey bacon strips were quite limp, and the garden salad on the side was dry without any vinaigrette. Worth ordering for the burger though. 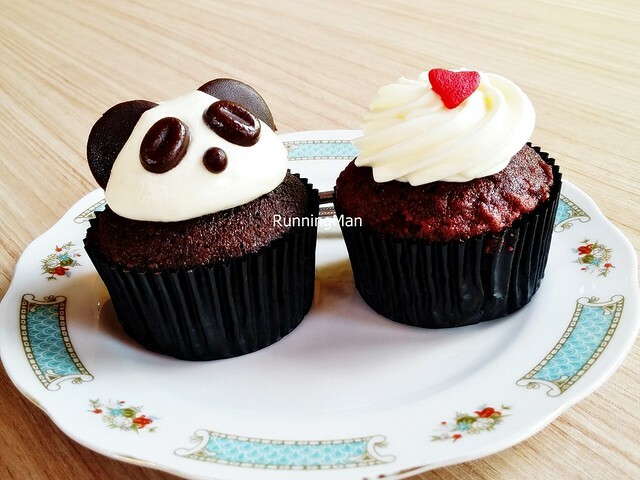 Added on these gourmet cupcakes (SGD $2 each). 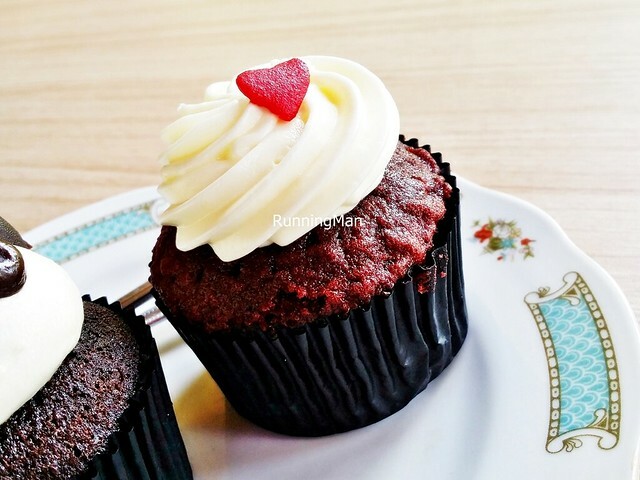 The Classic Red Velvet Cupcake (SGD $3.50) has a tasty raspberry vanilla cupcake topped with fresh, thick cream cheese frosting, very lovely, not too sweet or heavy. 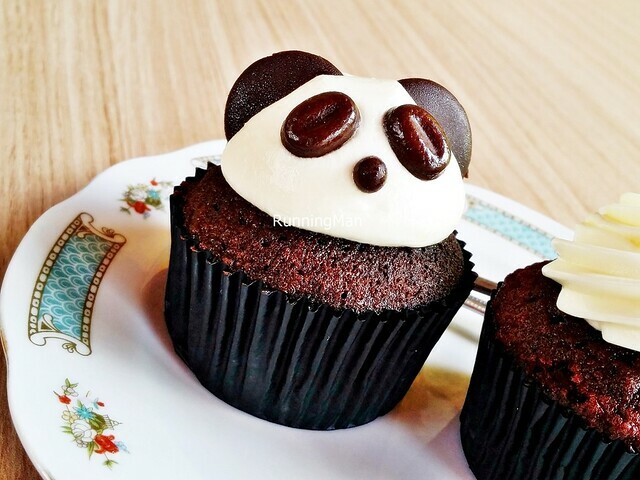 The Panda Cupcake (SGD $3.50) features a rich chocolate cupcake topped with fresh, thick cream cheese, and studded with luscious dark chocolate pieces, very satisfiying. 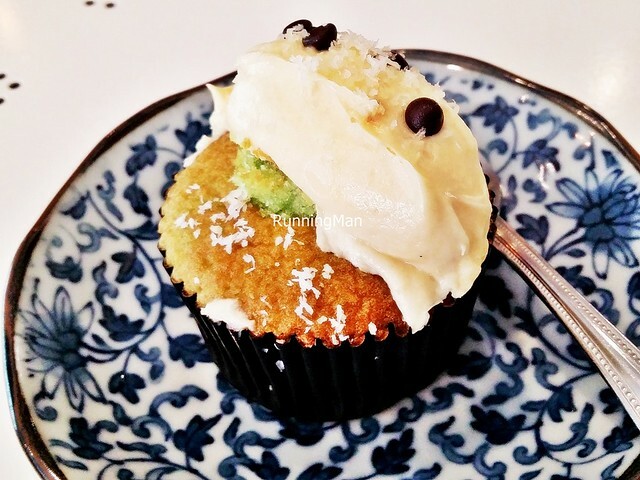 The Salted Gula Melaka Cupcake (SGD $3.50) is like a cupcake version of the Malay Onde-Onde Kueh, with a sweet Gula Melaka / palm sugar filling within a fragrant pandan / screwpine leaf cupcake, topped with salted Gula Melaka / palm sugar, dessicated coconut, and a luscious cream cheese. 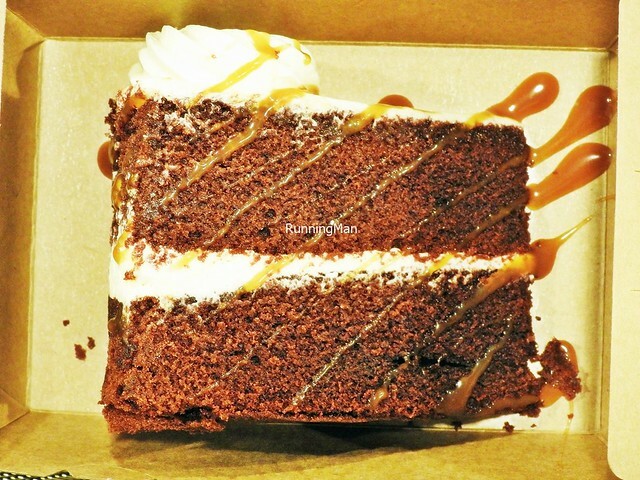 Ordered 2 slices of cake for takeaway, as it was a promotion (SGD $12). 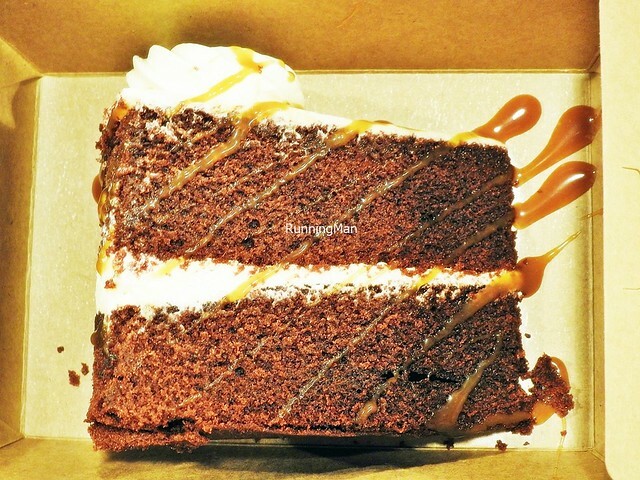 The Sea Salt Red Velvet Cake (SGD $7.90) is very good, with a semi-dry, sweet raspberry vanilla cake, topped with a salted caramel sauce. 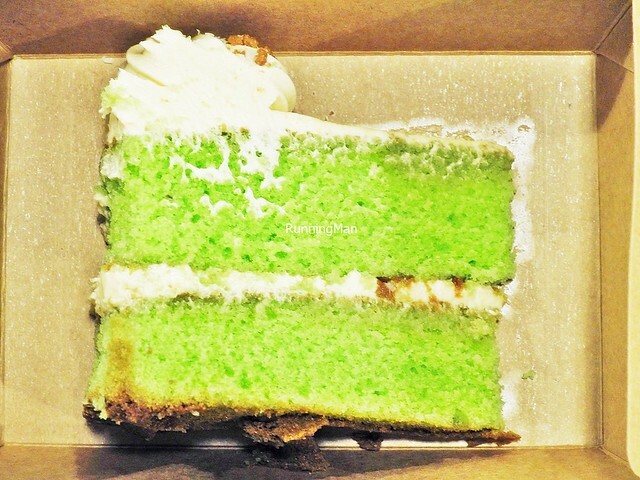 Tasty and light, though I wish the cake could be a little more moist. 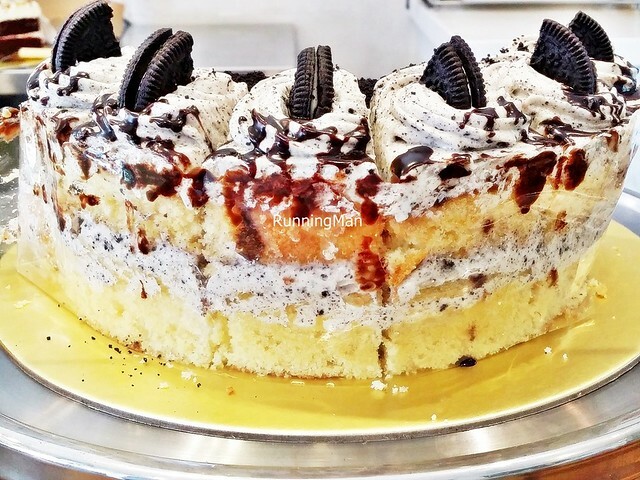 The Milk & Cookies Cake (SGD $7.90) is rich and creamy, a luscious buttermilk vanilla cake with good cookie flavour, but feels a little heavy if you eat too much of it. Still pretty tasty though. Ordered 2 of the tarts for takeaway, as it was a promotion (SGD $12). 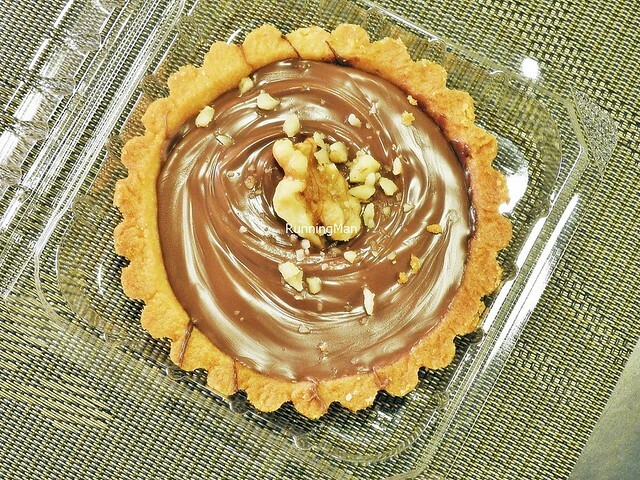 The Belgian Chocolate Tart (SGD $6.90) has a rich, luscious, chocolate filling, almost fudge-like in texture, and a crumbly, buttery tart base, it was so good! 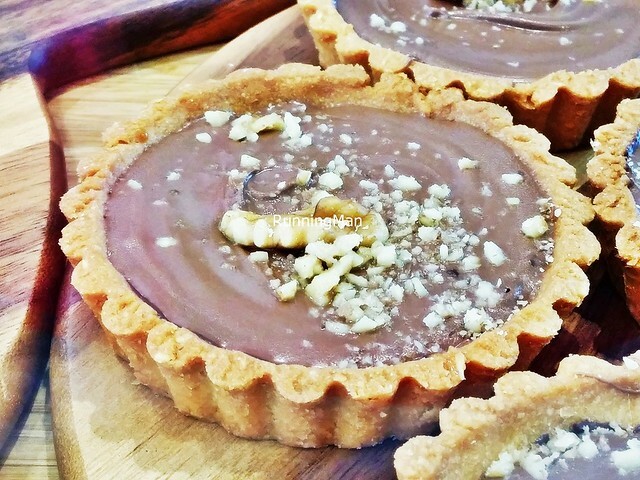 The Sea Salt Nutella Tart (SGD $6.90), I felt was even better, with a creamy hazelnut filling on a fragrant buttery almond tart base, cut through with sea salt sprinkles, sweet balanced by salty. This was so comforting and yet felt decadent, because it was so good I couldn't stop at 1 mouthful! 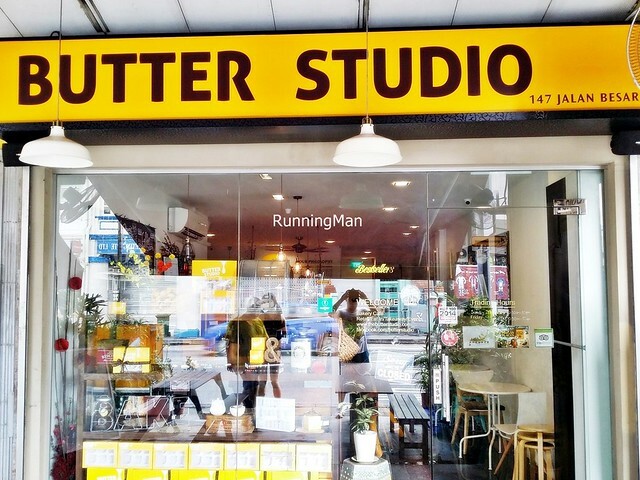 Update Nov-2016: Happened to be nearby, so paid Butter Studio a visit and ran into an old friend. 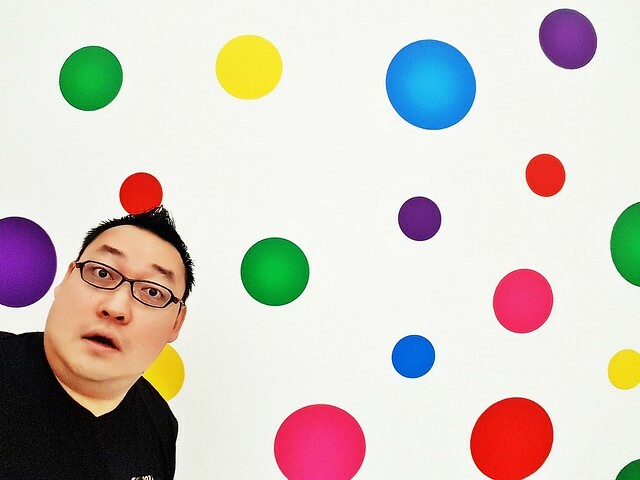 Now more than 1 year on, Butter Studio is doing better than ever, having expanded with more outlets across Singapore, as well as having gone into the overseas market. They still retain a strong following due to their tasty, halal certified products. At their original outlet, ambience remains largely the same, comfortable, casual, and welcoming. The service remains friendly and courteous, though it's still partial self-service. The food remains largely focused on dessert cakes, cupcakes, and pastries, with the regular popular items still featuring heavily. The main courses and brunch menu remains the same, with not much change. Prices have remained constant, which is good. 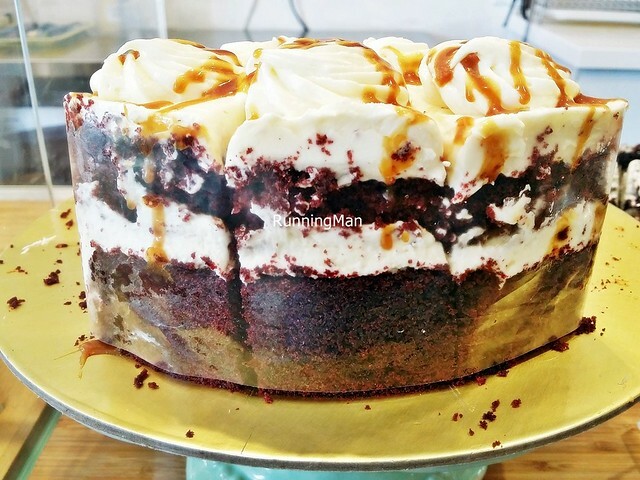 The Salted Caramel Red Velvet Cake (SGD $7.90) features a large, moist slice of chocolate vanilla sponge cake, layered with classic cream cheese, straight forward and delicious. Not overly sweet, which I like. The house made salted caramel sauce, which uses sea salt, is rich and luscious, featuring a nice balance of salty and sweet. Good! 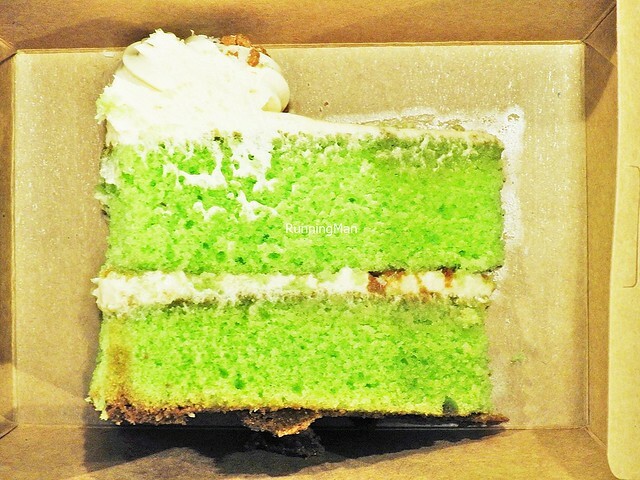 Loved the tasty Speculoos Ondeh Cake (SGD $7.90), with its large, soft, moist texture to the sponge cake, made with cold-pressed, fresh pandan / screwpine leaf juice. Topped with cookie crumbs and speculoos / speculaas cream frosting, which is a sweet, nutty, spiced shortcrust biscuit frosting. Nice balance of flavour, not too sweet, and not too rich, easy to eat. Lovely! 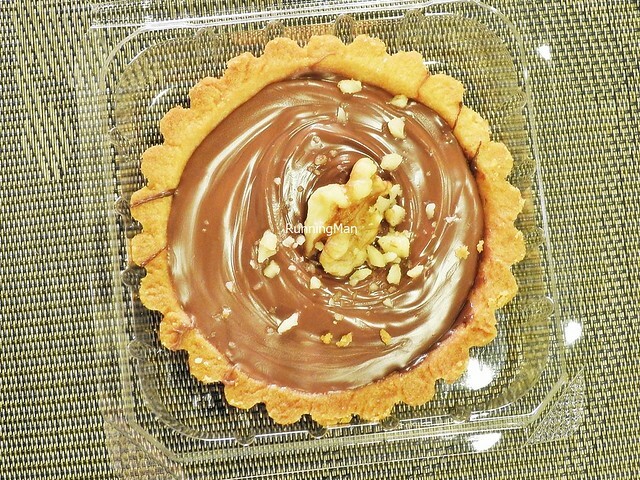 The Sea Salt Nutella Tart (SGD $6.90) remains as good as ever! The creamy hazelnut filling on a fragrant buttery almond tart base, cut through with sea salt sprinkles, sweet balanced by salty, incredibly good. Our friends finished this in double quick time, it was so good! Highly recommended! 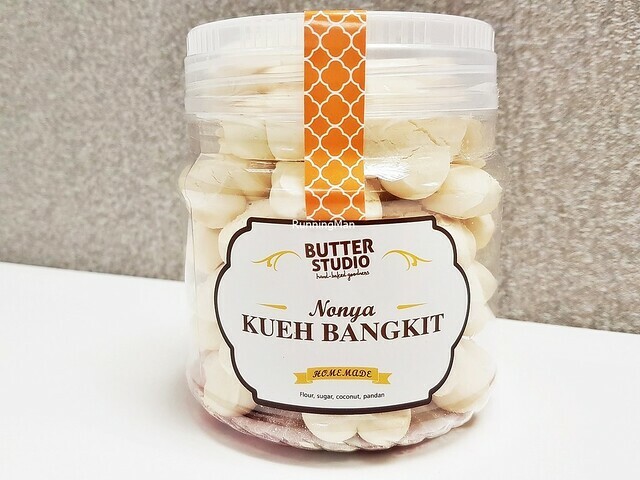 The Kueh Bangkit (SGD $22.80 / 300g) are traditional Peranakan / Malay Chinese cookies that have a melt-in-the-mouth texture. 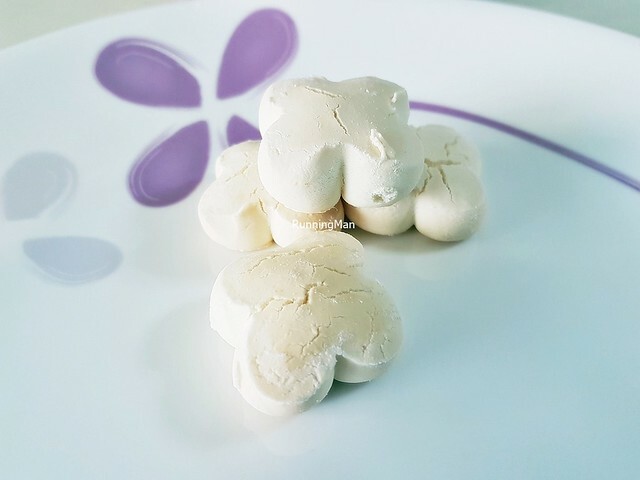 These flour cookies are made with water, sago flour, and icing sugar, then infused with coconut cream and pandan / screwpine leaf. This gives it a sweet floral earthy flavour, with a chalky crumbly texture that just melts the minute it touches your mouth. The version they have is excellent, well crafted and so tasty! 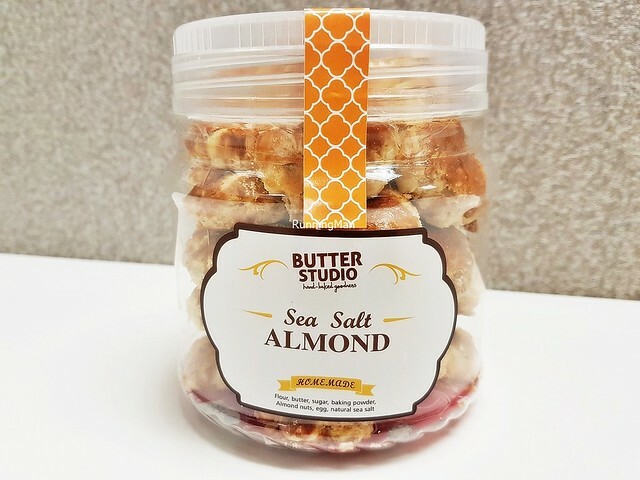 The Sea Salt Almond Cookies (SGD $26.80 / 400g) are delicious. 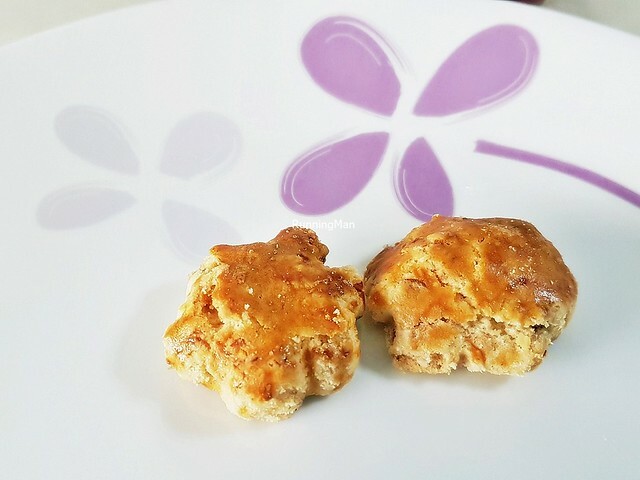 Made with water, all-purpose flour, butter, sugar, baking powder, almonds, eggs, and natural sea salt, these cookies have a crumbly, buttery texture. Taste is layered, you get the nutty sweet flavours, followed by a salty savoury touch. Really tasty. Good!